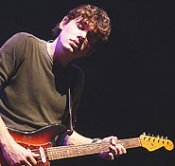 Pity the poor production slave who is tasked to handle the dressing room demands of John Mayer. The guitarist's backstage rider includes a variety of items that we have not previously seen requested by other performers. Yes, the affable Mayer wants thinly sliced meat, soy milk, and an organic fruit bowl, according to the rider, an excerpt of which you'll find here. But he also appears deeply committed to maintaining his oral hygiene and pleasant, toothy smile. Promoters must provide the 28-year-old musician with four "soft head" toothbrushes, a bottle of Listerine, two small tubes of mint-flavored toothpaste (Sensodyne or Tom's of Maine), and two packages of Altoids breath mints. Mayer also needs four organic lip balms and some Gold Bond powder. And how can you not love a guy who requires a copy of The New York Times and one box of a "Kids Brand Cereal" (either Cap'n Crunch, Count Chocula, Lucky Charms, Cookie Crisp, or Cinnamin Toast Crunch). Submitted by NellieBly on Sun, 2010-09-26 08:17. Can't these people carry around their own toothbrushes and lip balm? Submitted by jonnywad1234 on Wed, 2010-08-25 01:02.